The emergence on the high-streets of northern Europe of coffee chains extolling the glamour of the Italians’ love affair with caffeine have brought the virtues of nutmeg and cinnamon to a new audience. If they’re not dusting the tops of their cappuccini with the spices, customers are tucking into a slice of torta di mele or a more robust wedge of Siennese panforte, both of which include them in the list of ingredients. However both of these spices have as much, if not more, to contribute to the savoury side of Italian dishes. Indeed, many would argue that far removed from the glamour of the stainless steel counters, industrial machines and the hum of conversation that are the stock in trade of the coffee outlets, it is in the more humble casserole or stockpot where both nutmeg and cinnamon do their best work. Take, for example, the ragu of Bologna. Yes, its beauty is founded upon the classic soffritto combination of onions, carrot and celery, but it is the addition of milk and a grating of nutmeg seed that brings it alive on the palate. The spice acts as a counterbalance to the acidity of the plum tomatoes as well as complementing the sweetness of the pork. The same important role is taken up by cinnamon in a Roman pot of braised oxtail. While the meat and tomato are destined to take the leading roles, it is the background flavour where the cinnamon makes an important contribution. 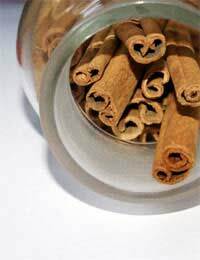 Remember that the amount of nutmeg and cinnamon should be limited to two teaspoons at most because they both have a surprisingly strong character, and excess can upset the balance of flavours, never mind the sensibilities of your diners. An equally famous dish claimed by the Bolognese is a plate of tortelloni stuffed with spinach and ricotta. Here again, it is the judicious use of nutmeg that can lift the pasta parcels from the ordinary to a most memorable primo course. Having sweated down the spinach and squeezed it inside a tea towel several times to remove the excess water, chop the vegetable finely and amalgamate with the ricotta. A little seasoning and grated nutmeg are the final touches to a mix that can then be spooned over half of each pasta case before sealing. In this case, you will find that the blank canvas that is the ricotta provides the perfect vehicle upon which to showcase the virtues of the nutmeg. Another pasta stuffing that benefits from the addition of nutmeg is a mix of pumpkin (zucca) and parmigiano reggiano. (If you can’t find pumpkin, either sweet potato or squash make admirable understudies.) As with the spinach mix, always ensure that you remove as much moisture from the vegetable as possible, otherwise it will seep into the pasta casings, making them soggy and liable to disintegrate when placed in the boiling water. In terms of buying off the supermarket shelf, it is advisable to purchase the whole nutmeg seeds, which can be grated using a Microplane to the quantity desired, rather than the ground variety. Similarly, cinnamon sticks rather than the ground equivalent are the ideal. In the case of the latter, simply place a whole stick, or a portion of it, into the braise, depending on the amount needed, remembering to remove and discard it at the end of the cooking process.